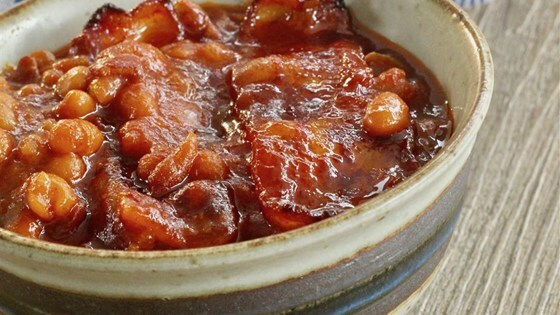 "I came up with this recipe after having made some bourbon baked beans and seeing a recipe for cola baked beans and I thought: Why not combine the two?" 1Preheat oven to 350 degrees F (175 degrees C). 2Mix brown sugar, paprika, mustard, and cayenne pepper together in a bowl. Whisk in pepper soda, ketchup, and Worcestershire sauce until brown sugar is dissolved. 3Cut 4 slices of bacon into small strips. Cook and stir in a large Dutch oven over medium heat until almost crispy, 3 to 5 minutes. Transfer to a bowl, reserving bacon grease. 4Stir onion into the bacon grease in the Dutch oven; cook and stir until soft, 3 to 5 minutes. Add garlic; cook and stir for 1 minute. Pour in bourbon, stirring to scrape up browned bits off the bottom with a wooden spoon. Stir bacon strips back in. 5Pour brown sugar mixture and baked beans into the Dutch oven. Simmer until beans are heated through, about 15 minutes. Arrange remaining 4 slices of bacon on top of the beans. 6Bake in the preheated oven, covered, until beans are bubbly and sauce is syrupy, about 3 hours. Substitute apple cider vinegar for the bourbon if you don't want to use alcohol.